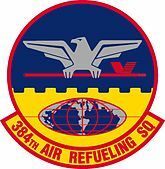 The 384th Air Refueling Squadron is an active United States Air Force unit, stationed at Fairchild Air Force Base, Washington, where it is assigned to the 92d Operations Group and operates the Boeing KC-135 Stratotanker aircraft conducting air refueling missions. The first predecessor of the squadron is the 584th Bombardment Squadron, a Martin B-26 Marauder unit that served in the European Theater of Operations, where it warned a Distinguished Unit Citation and a French Croix de Guerre with Palm. After V-E Day, it served with the occupation forces in Germany until inactivating in 1946. The 384th was activated in 1955 at Westover Air Force Base, Massachusetts, where it served as a Strategic Air Command air refueling unit until inactivating in 1966. It was activated again in 1973 and, except for a brief period of inactivation, has performed global refueling missions since then. The two squadrons were consolidated into a single unit in 1985. 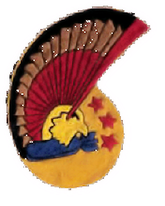 The squadron flew combat missions in the European Theater of Operations from, 23 March 1944 – 20 April 1945. It conducted aerial refueling for Strategic Air Command bombers in North Atlantic area from, 1955–1965 and has flown worldwide aerial refueling sorties since 1973 including support to operations in Panama from, 18–20 December 1989 and Southwest Asia from, August 1990–March 1991. The squadron was activated on 23 March 2017 at Fairchild Air Force Base, Washington. The activation date was chosen because it was the 73d anniversary of the squadron's first combat mission during World War II. ^ a b c d e Thornbury, A1C Christopher (September 23, 2016). "384th ARS deactivates, makes room for KC-46". 22d Air Refueling Wing Public Affairs. Retrieved October 6, 2016. ^ a b c d e f g h i Dollman, TSG David (October 28, 2015). 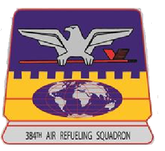 "Factsheet 384 Air Refueling Squadron (AMC)". Air Force Historical Research Agency. Retrieved October 6, 2016. ^ a b c d e Richardson, SRA Mackenzie (March 14, 2017). "Team Fairchild welcomes the 'Squarepatchers'". 92d Air Refueling Wing Public Affairs. Retrieved August 15, 2017.